The wheels are modified Custom Chrome RevTech Billet items, going up a size to 18” at the front and down a size to 16” at the back. They’re shod with Metzeler ME880 Marathon tires. 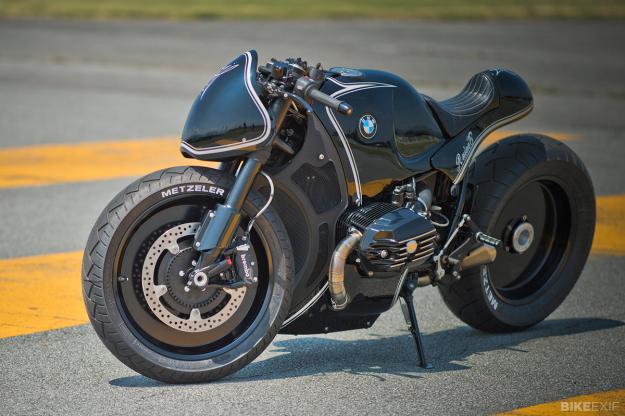 The forks are standard R nineT—originally specc’d for the S1000RR—but dropped two inches with custom internals and coated black for an extra stealthy look. The rear frame has been modified, along with the top yokes and steering stem, and there’s an upgraded Brembo master cylinder to boost braking power. The foot controls are custom fabricated and the clip-on bars are from ABM. The hand-beaten aluminum bodywork is a styling tour de force, and could be straight off the set of a Dark Knight movie. Check out the front of the frame: the skeletal mesh enclosure that blends with the tank and belly pan is a work of art. 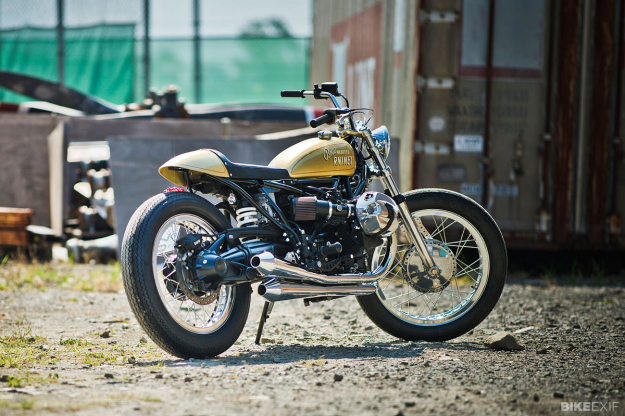 BRAT STYLE CYCLONE Go Takamine is one of the most influential motorcycle builders in the world. His shop, BratStyle, is synonymous with the look of new wave customs, and has spawned a thousand imitators. There’s always a visual lightness and vintage flavor to BratStyle builds, and those aspects have come to the fore on Takamine’s R nineT. Given the stock bike’s heavyset nature, the feeling of delicacy on this machine is quite remarkable. 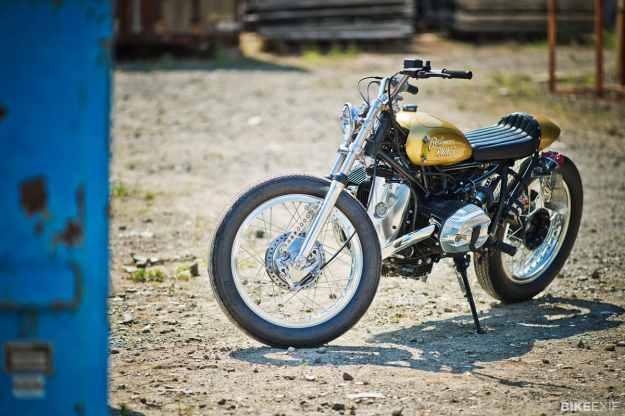 Takamine’s goal was to create a bike for short city trips, with a mix of old and new flavors and a dirt track vibe. The front end is all Ceriani, including the forks, the steering stem and damper, and the top yoke. The wheels have gone up in size, with a 19” at the front and an 18” at the back. (The rims are Akron H-style.) And being a traditionalist at heart, Takamine has not only removed the ABS, but also fitted a twin-leading shoe front drum brake. The tires are Allstate Safety Tread. 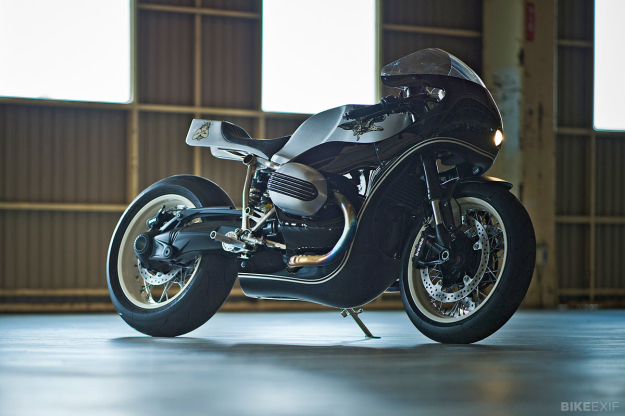 The bodywork is all-new and has transformed the appearance of the R nineT. There’s a custom aluminum front engine casting, and the cylinder heads have been plated and polished to match. 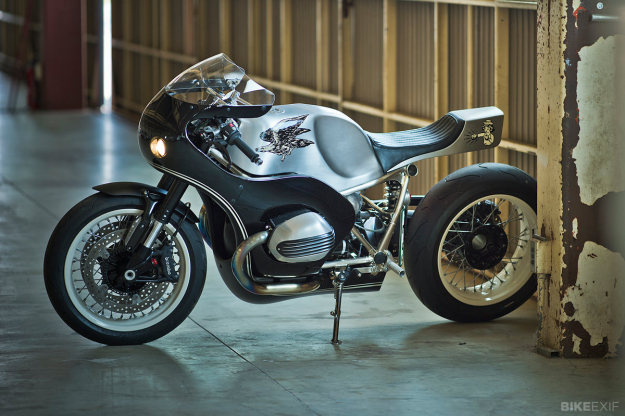 The icing on the cake is a simple hand-fabricated exhaust system straight out of the 1960s. HIDE MOTORCYCLE BOXER The simple, organic designs of Hideya Togashi have been charming Japanese custom fans since 2003; today he’s one of the leading Harley Sportster builders in the East. Togashi has taken a minimalist approach, looking for maximum impact from relatively few mods. The hand-beaten, unfinished aluminum bodywork is timeless and flowing, giving the R nineT a super-sleek look with a hint of 1970s GP bikes. New cylinder head covers have a sandcast-style texture, and the frame has been returned to a lighter, more natural finish. The wheels are actually stock—but again, the black finish has gone, swapped out for a light powdercoat. The rubber is Metzeler’s Racetec Interact. The exhaust system is easy to miss, but beautifully bent and routed. The headers curve back into the frame and then vent near the under-seat shock. And the custom foot controls echo the new frame finish just perfectly. 46WORKS CLUBMAN RACER Shiro Nakajima is no stranger to these pages. 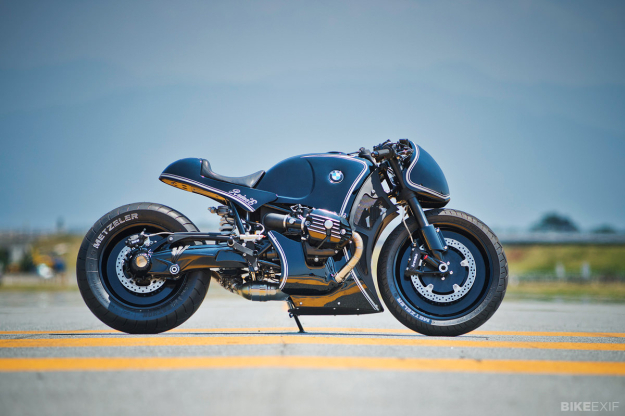 Under the Ritmo Sereno moniker, he’s built some of the most intoxicating custom BMWs and Moto Guzzis we’ve ever seen. 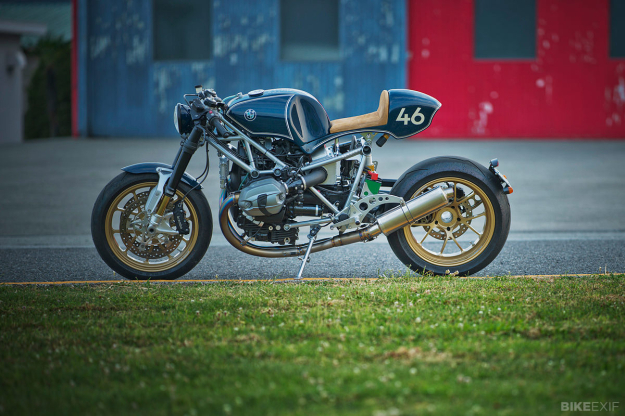 Nakajima has just gone back to basics with a new shop, 46Works, and builds race-flavored customs that work on the track as well as on the road. 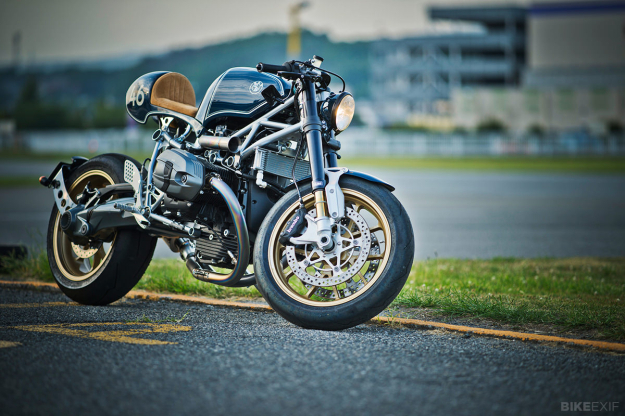 His R nineT is bristling with lightweight parts that reduce the weight by around 30 kg. The stock Sachs forks are gone, replaced by Ohlins items matched to a modified steering stem and top yoke. The wheels are MotoGP-style Bito R&D Magtans running Pirelli Diablo Supercorsa rubber. The exhaust system is hand-built titanium, and Nakajima has crafted a titanium ram-air intake too. Interestingly, he’s also removed the ABS system—presumably to suit his riding style on the track. Ancillary components are from the very best Japanese brands, including Earl’s (oil cooler), Posh and Daytona (lighting) and Battle Factory (clip-ons). The biggest challenge for Nakajima was hand-beating the new aluminum bodywork: as a man who usually focuses on mechanical upgrades to his bikes, this was a new experience for him. The result is immaculate though, and topped off with subtle paint and a traditional pinstripe. 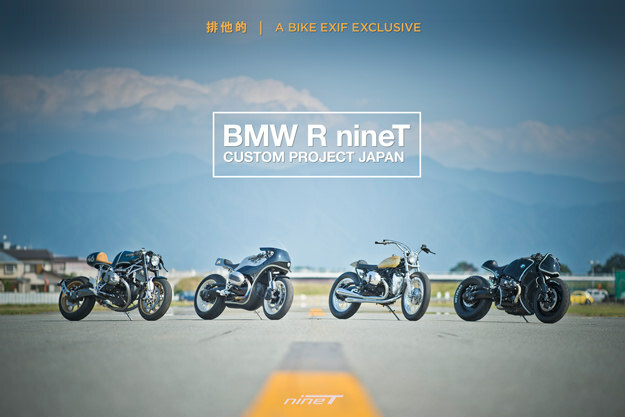 To see more of these bikes and the stories behind the builds, visit the official R nineT Custom Project website. Or read our follow-up interviews with the builders here.